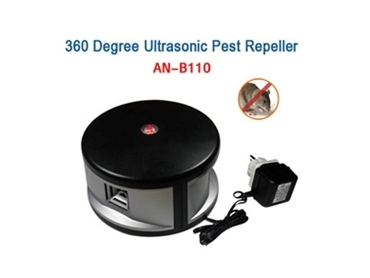 The 360 Degree Ultrasonic Pest Repeller from Enviro Bug Control is a powerful unit that covers an area of 4000 square feet and is highly effective in the control of mice, rats, cockroaches and common insect pests. After laboratory researched showed that if you created 140 decibels of sound pressure, ultrasonic sound waves attack the auditory and nervous systems of most insect pests and cause them pain and discomfort. The high intensity sound waves which are out of the range of hearing for humans and household pets such as cats and dogs force the pests to give up their source of food, water and shelter and move on elsewhere. Ideal for homes, farm sheds, stables and garages the repeller comes with a plug in lead which allows you to place it to get the most effective response. It is important to know that it could take 2 or more weeks for the pests to change their habits before moving on.